ArcGIS Survey Analyst saves time for surveyors in the field and in the office. Least squares adjustment helps to locate parcel corners and monuments. 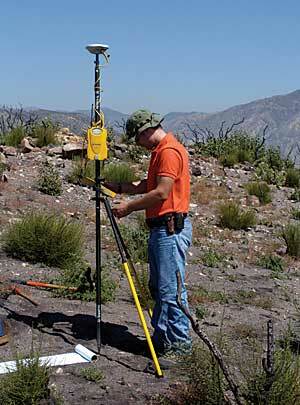 GIS data is downloaded into handheld data collectors and recognized by survey equipment. When the Old Fire swept through Southern California's San Bernardino Mountains in 2003, it burned more than 91,000 acres and destroyed nearly 1,000 homes. One of the areas hit hardest by the Old Fire was the community of Cedar Glen, located near the southeastern shore of Lake Arrowhead. Despite Lake Arrowhead's heavy concentration of shopping, estates, boat slips, and waterfront development, nearby Cedar Glen is largely unpopulated. Before the Old Fire, the mountain town was home to fewer than 550 houses and even fewer permanent residents. During the fire, many houses in Cedar Glen were burned to the ground, with most of the damage taking place on the desolate Hook Creek Road. Although spared by 2007's Slide Fire, Hook Creek Road is still a graveyard of house foundations, vacant lots, and charred tree stumps. 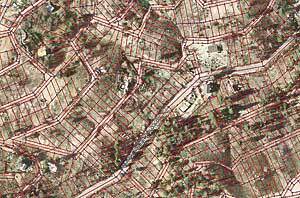 Overlaid on aerial photography, the cadastral fabric shows survey control, line points, points, lines, and parcels in Cedar Glen. The county is using the tools and workflow in ArcGIS Survey Analyst to survey the location of a new waterline in the roadbed of Hook Creek Road. The silver lining in the damage done to Hook Creek Road is that due in part to a nonexistent waterline, the area, although plotted and parceled, was never fully developed. Residents relied on private wells, and because of that inconvenience, many parcels were not purchased. Recently, the San Bernardino County Redevelopment Agency has concentrated on redeveloping Cedar Glen, and a major part of that plan includes providing water to Hook Creek Road properties by placing a waterline underneath the roadbed. Before engineering plans could be drafted, county surveyors were called upon to establish the road's right-of-way. While referencing Cedar Glen survey records, dating as far back as the 1930s, San Bernardino County supervising land surveyor Ryan Hunsicker discovered that there were many conflicting measurements from one historic document to the next. In the meantime, county field crews found that the damage done by the blaze was not limited to structures and vegetation. Hook Creek Road's already sparse and archaic survey monuments (location markers) were also victims of the Old Fire. After the Old Fire swept through Cedar Glen, San Bernardino County surveyors used the cadastral fabric in ArcGIS Survey Analyst to locate damaged and missing survey monuments. "Some of the monuments were marked on trees that burned and some monuments were marked by wood stakes that were burned beyond recognition," laments Hunsicker. "Trying to find monuments that may or may not exist using survey records that don't agree can be a timely process. Traditionally, we would survey by trial and error until we found a way to resolve the issue." San Bernardino County's usage of Esri's GIS software began in the mid-eighties when its Geographic Information Management System (GIMS) was created to help county departments launch GIS applications. The county covers more than 20,000 square miles, the largest in the lower 48 states, and GIMS, as well as the county's land surveying practices, has evolved during the last two decades. 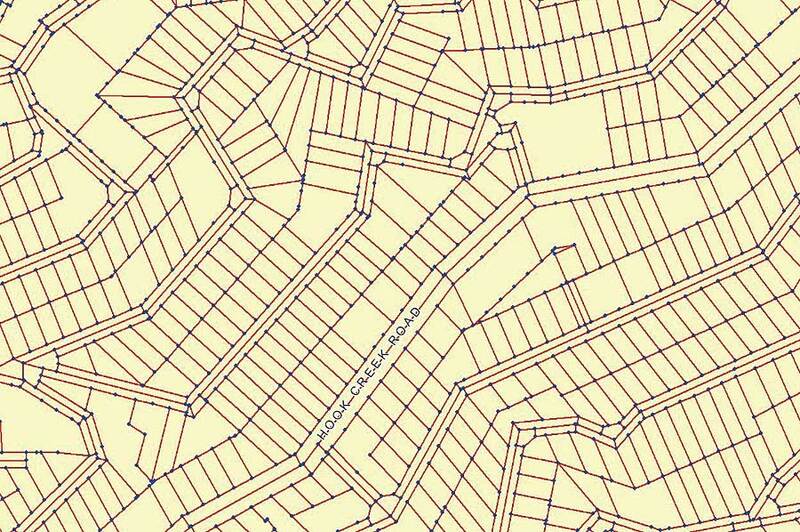 As an active participant in Esri's Software Beta Program, the county's Survey Division provided feedback for the development of the new Cadastral Editor workflow inside ArcGIS Survey Analyst. The Software Beta Program gave Hunsicker an early opportunity to manage survey data in an ArcGIS environment. From that experience, he applied the tools in ArcGIS Survey Analyst to provide a time- and money-saving solution for the dilemma on Hook Creek Road. 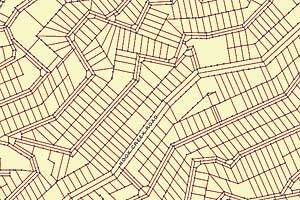 "Instead of going out in the field with paper maps and just searching for monuments blindly," explains Hunsicker, "we took all the historic documents from the Hook Creek Road area and transferred that data into Cadastral Editor. Then we used the least squares adjustment to sort out the best solution for locating parcel corners and coordinates." After being found using ArcGIS Survey Analyst Cadastral Editor, a property corner is measured using Real Time Kinematic equipment. With Cadastral Editor, individual parcel data can be entered into the GIS using coordinate geometry (COGO)-based tools. As new surveys are entered, an integrated cadastral fabric is developed, while a built-in least squares adjustment accurately and incrementally updates the fabric with the best-fit representation of the parcel layer. Cadastral Editor also tracks parcel history and linage by maintaining the legal recording data. "Once the division had a solution for coordinates, it used GIS to produce an ASCII file and downloaded it into the handheld data collectors that talk directly to our survey equipment in the field," continues Hunsicker. "Initially, Cadastral Editor got us within a few feet of each monument, and it has incrementally gotten better as we've found more monuments and have brought them into the cadastral fabric." The Cadastral Editor solution used on Hook Creek Road has saved the county such a significant amount of time in the field that Hunsicker has visions of a program that would transfer data back and forth between an ArcGIS Survey Analyst software-equipped Windows mobile computer and the county's field surveying equipment. For more information, contact Ryan Hunsicker, supervising land surveyor, San Bernardino County Surveyor's Office (e-mail: rhunsicker@dpw.sbcounty.gov).